For smallest hands, book-based entertainment abounds. 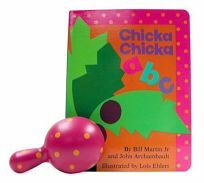 Fans of Chicka Chicka Boom Boom can shake a tiny maraca to the beat of ""A told B and B told C, l'll meet you at the top of the coconut tree"" with the Chicka Chicka ABC Board Book & Rattle by Bill Martin Jr., illus. by Lois Ehlert. .